I often joke that my investment property earns more than I do. Thinking more about this led me to the realisation that my investment property has an privileged position in the tax system when compared to a measly old human. Below I summarise some of the main tax considerations from the perspective of being a human making wages, or from the perspective of being an investment property (the property owner). After making this comparison, our current system appears to be designed exclusively for the betterment of the property community, rather than the people community. It’s unreal. The whole thing is back to front, with all that green showing investment property to be a clear tax winner. Let us take a closer look at the marginal effects of a dollar increase in income for a one-income family, with two school-age children earning $100,000. They are an above-median household, and a prime candidate property investor. You know. To secure the children’s future. 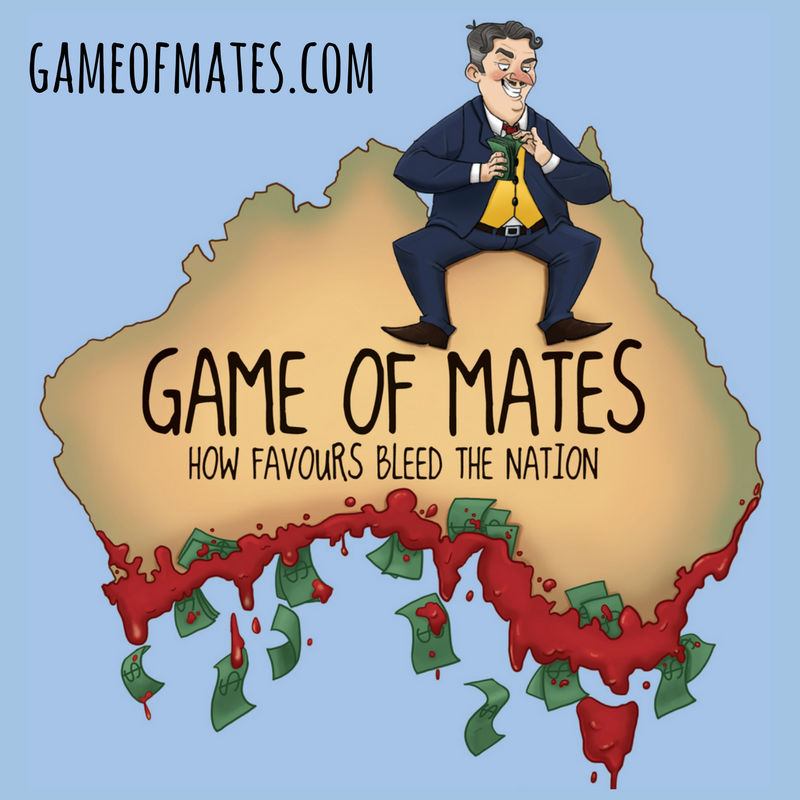 We’ll call them the ‘Battler’ family, because in Australia if you aren’t on the property ladder, making money is a battle. An extra dollar in wage income for the Battler family over a year attracts income tax, along with a loss of family tax and medicare benefits that together account for 60c of that extra dollar. So 40c in the pocket. 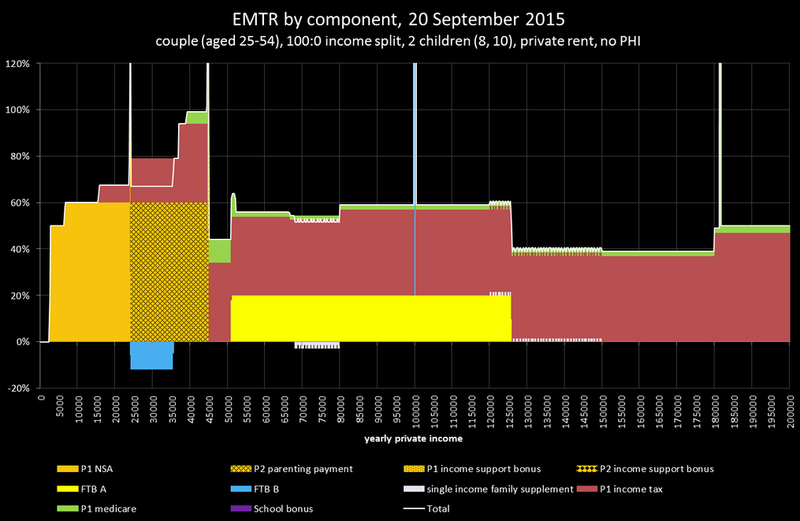 The graph below, from David Plunkett, shows the effective marginal tax rates (EMTR) for this family currently in Australia. Let us examine the case when the Battler family instead makes their extra dollar from capital gains on their investment property. Using round numbers, they buy a $500,000 home with an annual rental income of $20,000, and annual rates, maintenance and other costs of $6,000. They finance this purchase with an interest only loan attracting a $25,000 annual interest bill. They make a loss of $11,000 over the year they own the property. Of that loss they are out of pocket only $4,400, because they have reduced their taxable income and avoided $4,000 in tax, and gained $2,200 in family tax and medicare benefits. After one year they sell with a price after selling costs of $511,001, making $1 net over the year from the property investment project. It’s a risky way to make $1, compared to getting a rounding-error sized pay rise. But we want to compare dollar-for-dollar the tax incentives for earning wages or earning capital gains though property speculation. 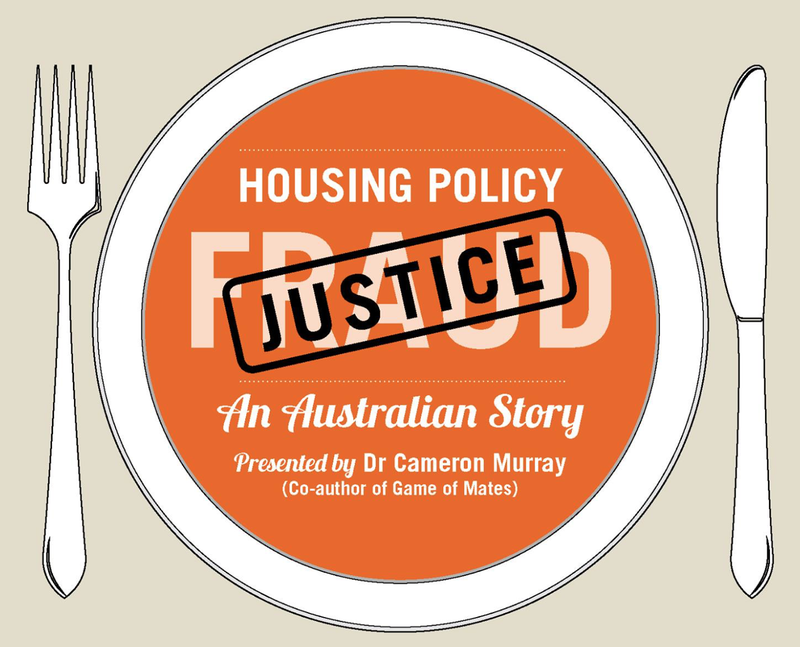 So what did the battlers get out of their $1 gain from property investment? First we factor in the 50% capital gains tax discount because they owned the property for more than a year. So they only need add $6,500.50 of the capital gains to their taxable income. With a 60% EMTR that means they keep $9,100.20 in the hand (the tax-free $6,500.50 half, plus 40% of the remaining $6,500.50). Subtracting last year’s net loss of $4,400 gives a total net gain of $4,700.20. I summarise how this arises from the benefits tax treatment of both the losses and the gains from investment property in the table below. With these types of advantages to making your money from lazy capital gains on investment property, rather than working for a living, it is no surprise that we have become a nation of property speculators. We can also work backwards to see in this example case how much of a loss on property the advantageous tax treatment will cover. To break even after tax all the Battler family need to do is make $4,400 after tax on the sale, which would be situation if the capital gains were $6,286, or a sale price after selling costs of $506,286. Under this situation the property investment has made a loss of $4,714 over the year (an $11,000 income loss and a $6,286 capital gain after 12 months), yet the tax system has bailed out that loss for the family through negative gearing and the capital gains tax exemption. Add another 57c or so to the project income - so it makes a $4,713.43 loss - and you are back to the same net outcome as making an extra dollar through wage income; a 40c gain. We can use this example to also see the immediate impact from tax policy changes targeting investment property. If we eliminate the capital gains tax discount and quarantine losses against property incomes, we get a different story, which is in the table below. Here the $11,000 loss rolls over to be deducted from the future income of the property, in this case the capital gains on sale, making the net capital gain of $1. Because none of this gain is subject to the CGT discount, it all adds to personal income and is taxed at the marginal rate, along with the losses in other welfare benefits. After tax both the $1 from investment property and the $1 from the wage income now provide the same benefit. It is certainly now time for the government to end these tax concessions for investment property. Raising the GST, the current government’s preferred tax policy, is probably the worst choice in terms of both equity and efficiency compared to the low-hating fruit of removing these property tax advantages which currently cost the budget about $11billion a year. Obviously removing them would change incentives, reduce prices, and so forth, meaning that actual budget gains from their removal will be lower. But even so, the shift of incentives across the economy would be hugely advantageous in terms of both efficiency, and equity, as these tax incentives primarily benefit the wealthy. Because many claim that negative gearing is a ‘natural result of the tax system’*, we can leave this alone and simply concentrate on the capital gains tax discount. 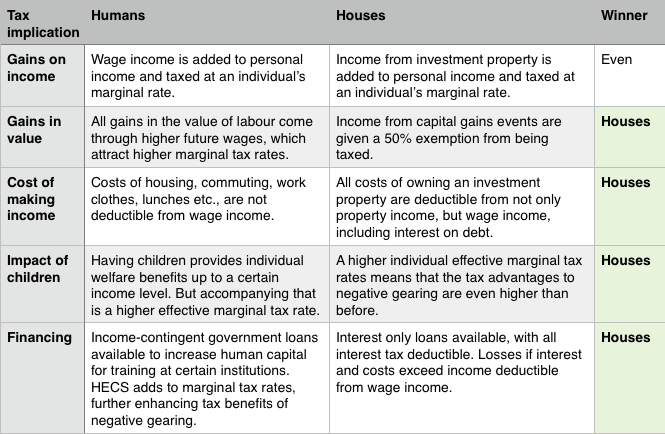 In this case, the table below shows how the tax benefits from negative gearing remain, yet the capital gains taxes completely offset the tax benefits from the losses made, resulting in the same net outcome. What this means essentially is that this small part of the tax code provides very perverse incentives for investors to speculate on property, than to earn income from wages. * To the extent that any tax system is ‘natural’. My view is that you use the system to create incentives for productive activity, whether they appear natural or not. Negative gearing is described by Hymen Minsky. He gave it a name, ponzi finance.